Hope y'all enjoyed your weekend. Let me show you my little progress in kashmiri embroidery project. 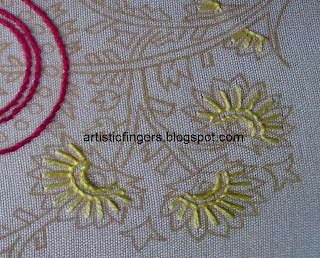 I'd stitched the main stems with stem stitch using two shades of green,the tiny growth under the paisley is satin stitch with maroon,the thorns are roman stitch and the calyx is satin stitch. 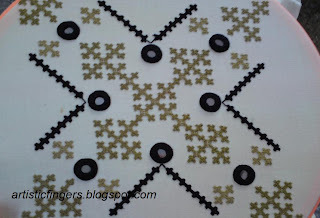 It looks like the design is almost complete,isn't it?. 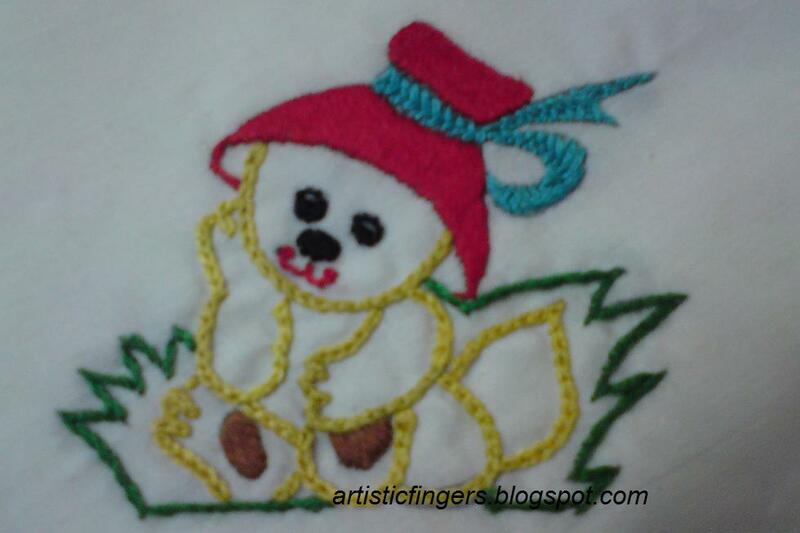 I've planned a couple of projects this weekend,the basic preparation is done,so come back to see what it is! 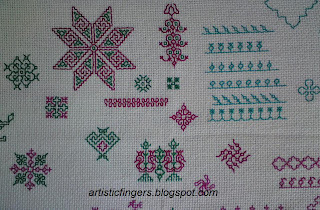 Let me give you a hint-first one is an Indian embroidery and the second is a needlepoint. 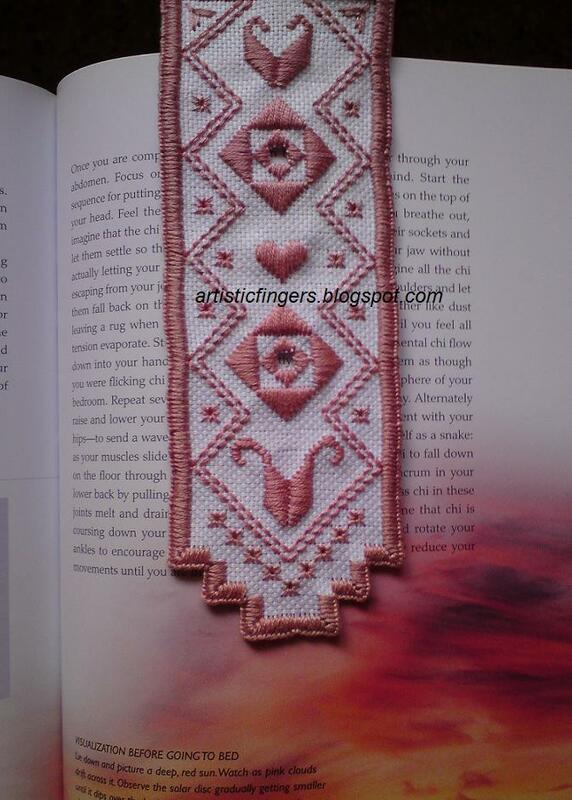 My mom' likes bookmarks.I've crocheted many bookmarks for her.She wanted an embroidered one. I'm stitching one more,will show y'all soon. 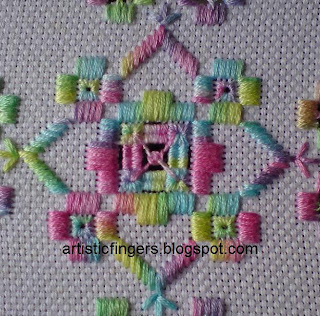 Today I'm going to show you how to stitch an Italian knot. 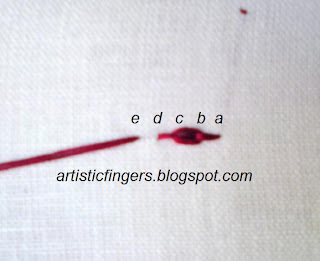 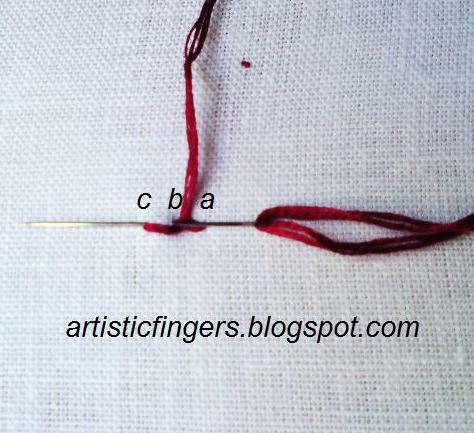 STEP 1 : Bring up the needle at 'a', go down at 'b', again bring it up at 'c' - a small running stitch is made. STEP 2 : Pass the needle under the running stitch made in step 1. 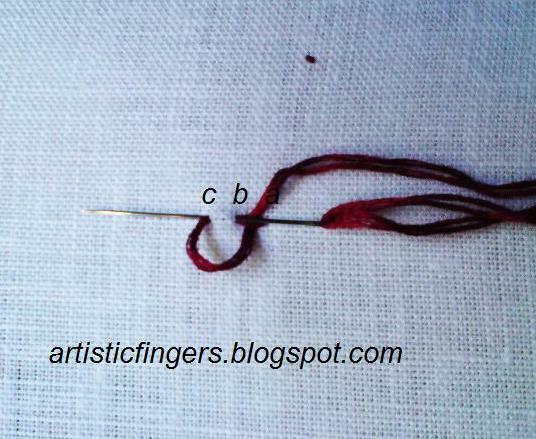 STEP 3 : Pull the needle leaving a small loop. STEP 4 : Pick up a small stitch by going down at 'b' and coming up at 'c'. 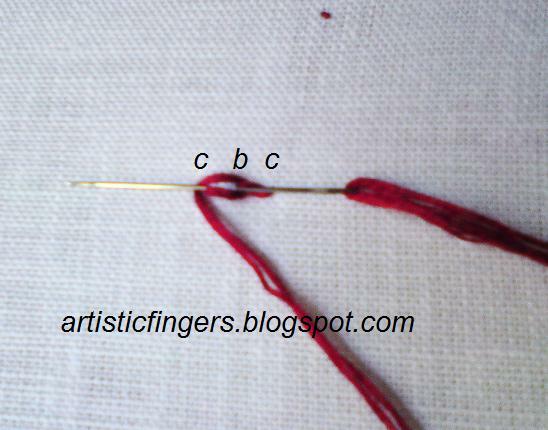 STEP 5 : Pull up the loop formed in step 3 as shown. STEP 6 : Bring the thread under the needle. 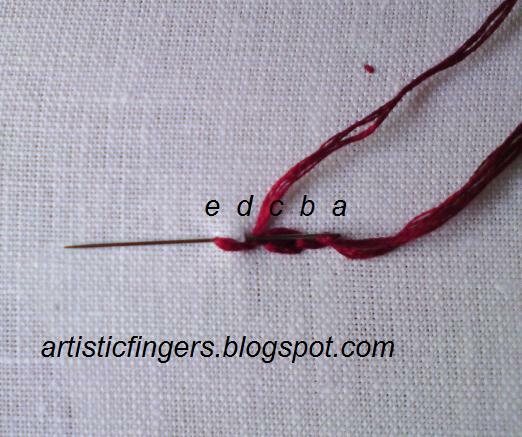 STEP 7 : Now pull the needle , first knot is made . 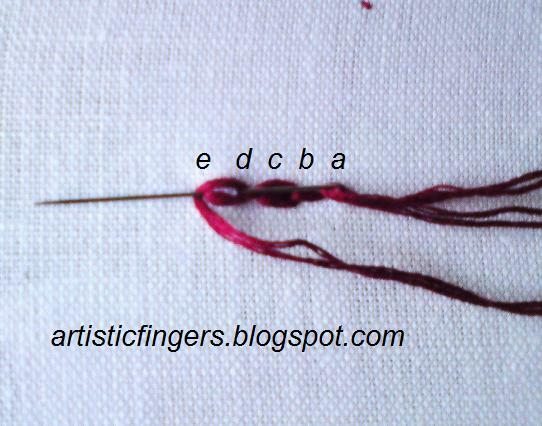 and pull the needle to make a running stitch. STEP 9 : Pass the needle under the running stitch made in step 8. STEP 11: Pull up the loop and work step 6 again. STEP 12: Work as of step 7, a second knot is made. I'd written about this knot in one of my earlier post.Hope y'all remember. 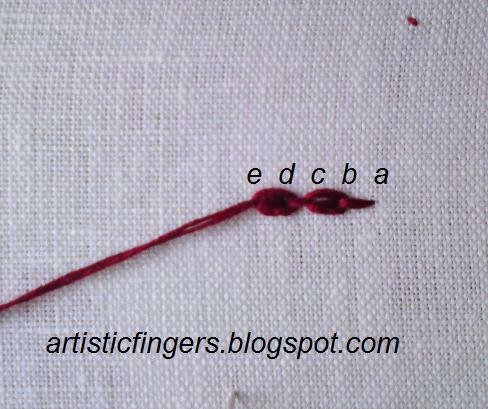 I learned this knot from my machine embroidery teacher Mrs.Rajeswari 20 years back. 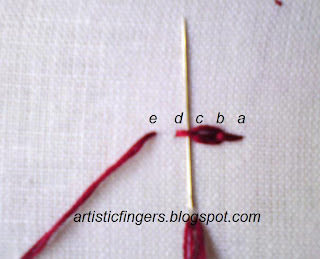 I was searching for this stitch in a dictionary/magazines etc for quite sometime now.But I couldn't find one.My teacher said she'd learnt this stitch from her sewing teacher when she was in fourth form/class.I don't have any proper reference for this stitch other than these little information which I'd noted down in my journal. This is the story behind my version of ITALIAN KNOT. 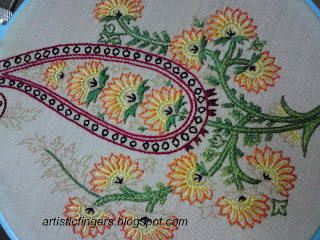 If any of you know this stitch by a different name,please do let me know. 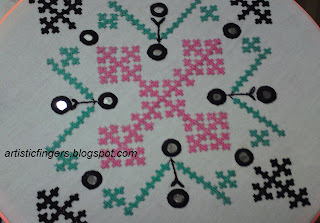 I'd like to hear from y'all,so feel free to leave a comment. 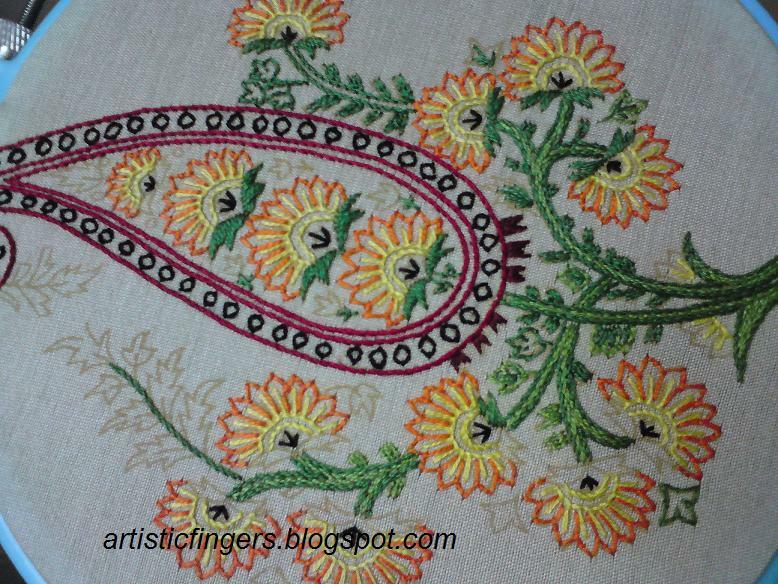 And this is the same design with a different color scheme.I stitched this long time back,thirteen years I think. Which one do y'all prefer? I'd like to thank you all for your support,comments and e-mails . 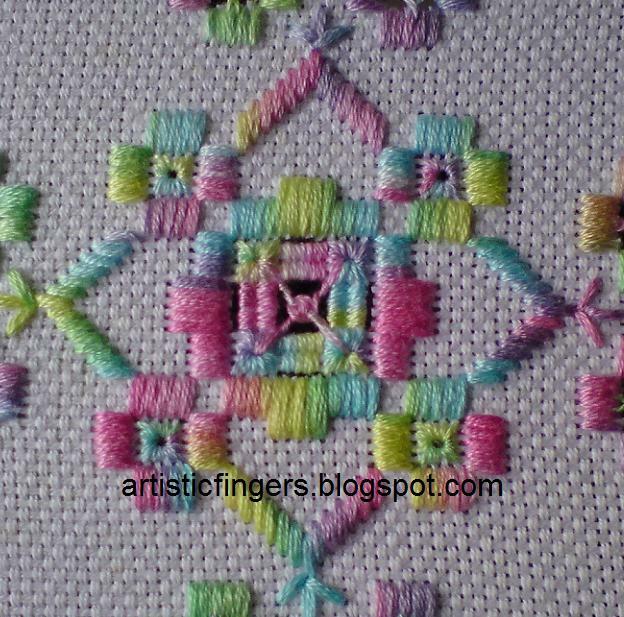 Today I'd like to show you all a small design which my 4 year old cute niece made me stitch for her. 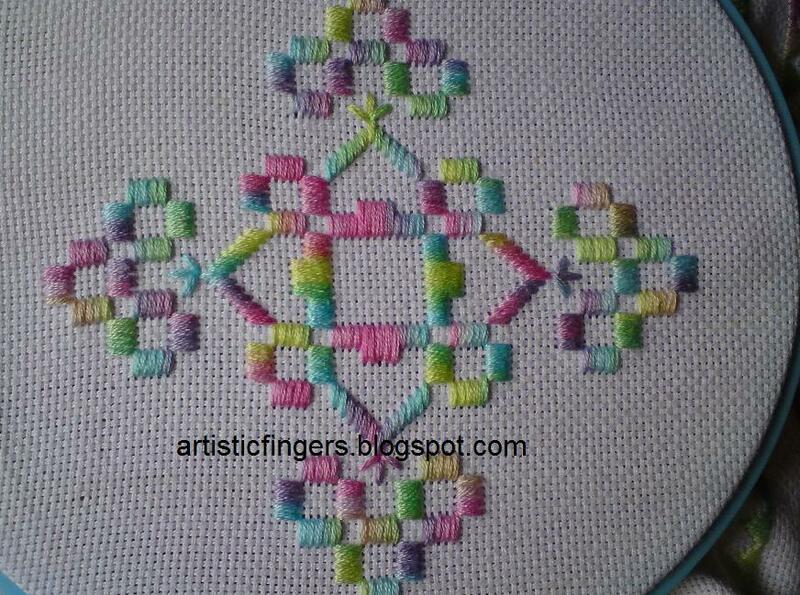 Can you believe that she chose the design,colors and also the stitches?. Kasuti embroidery is popular in southern India and it's similar to blackwork.I'll write more about this style in detail sometime later.This is one of my young student's Kasuti sampler. 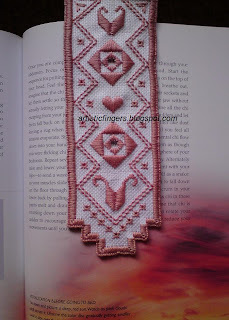 She's done a great job,isn't she?. 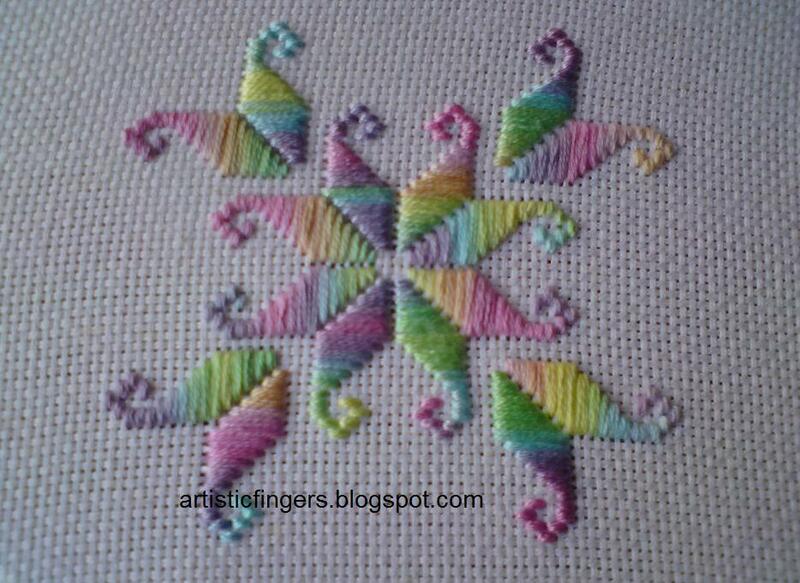 I always enjoy teaching little girls and this one has made my day. 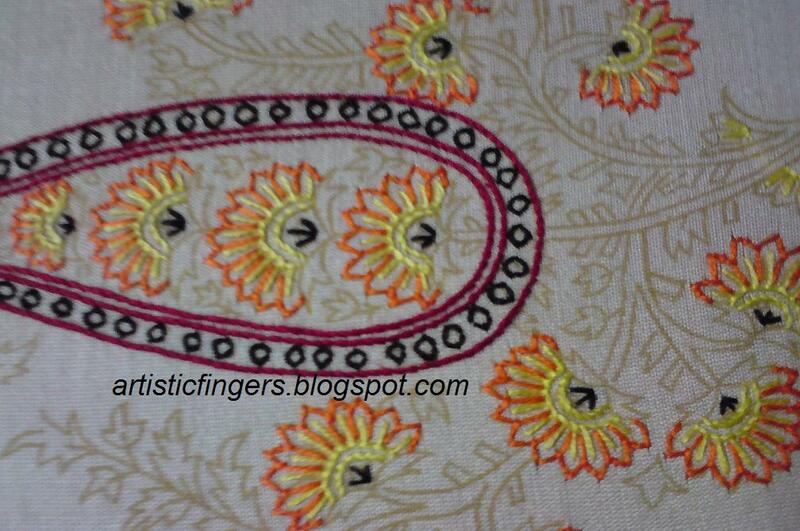 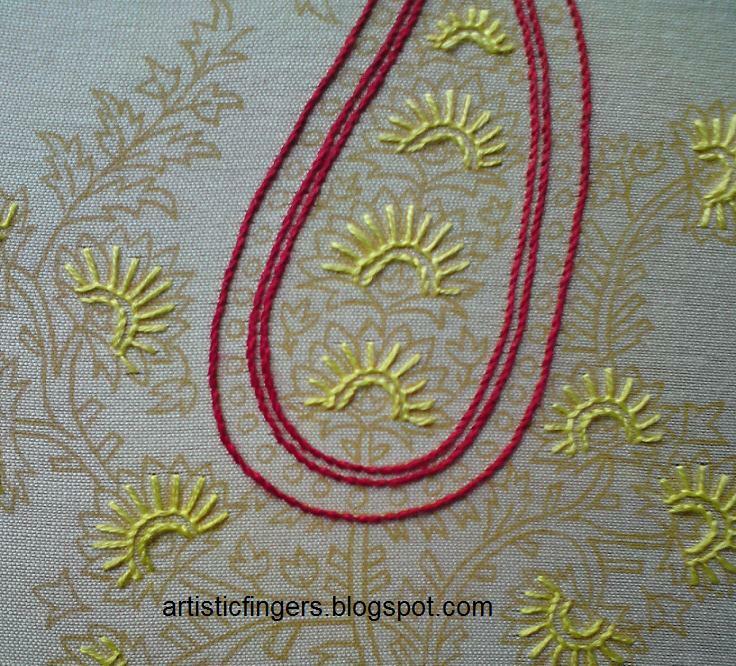 When you mail me regarding SAL,please do mention which form of Indian embroidery you'd like to stitch. I've finished the flowers in paisley project . 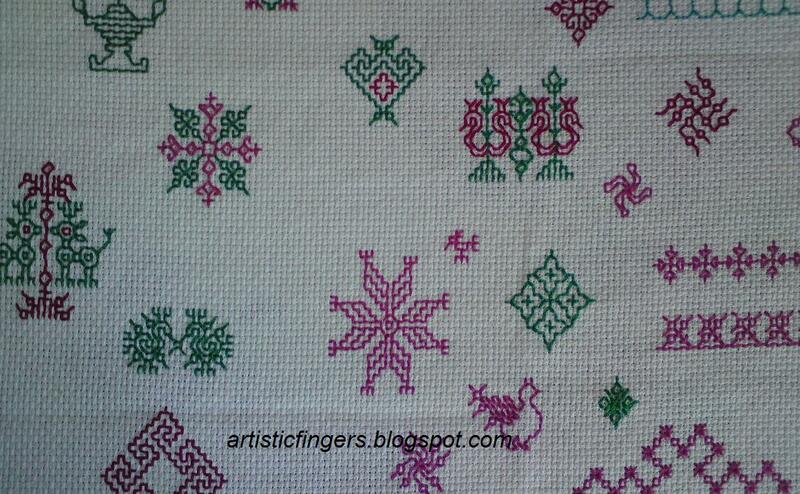 The black ones between the two rows of paisley outline is fly stitch. 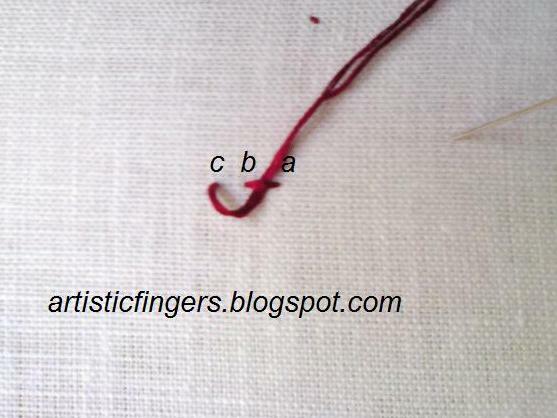 I've worked 2 fly stitches facing each other. 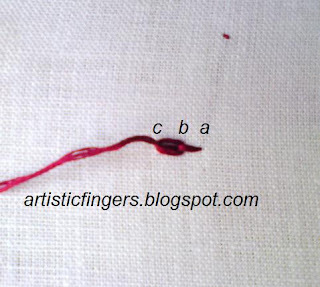 The black lines in the flower center is straight stitch.I've worked 3 straight stitches from the same point. 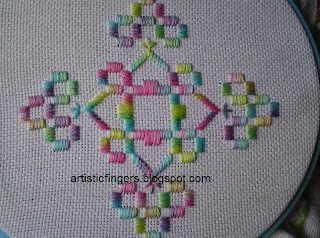 The flower outline is roman stitch variation. 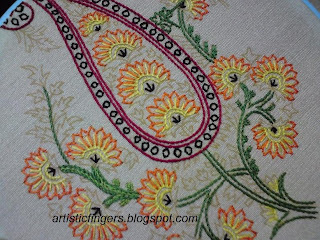 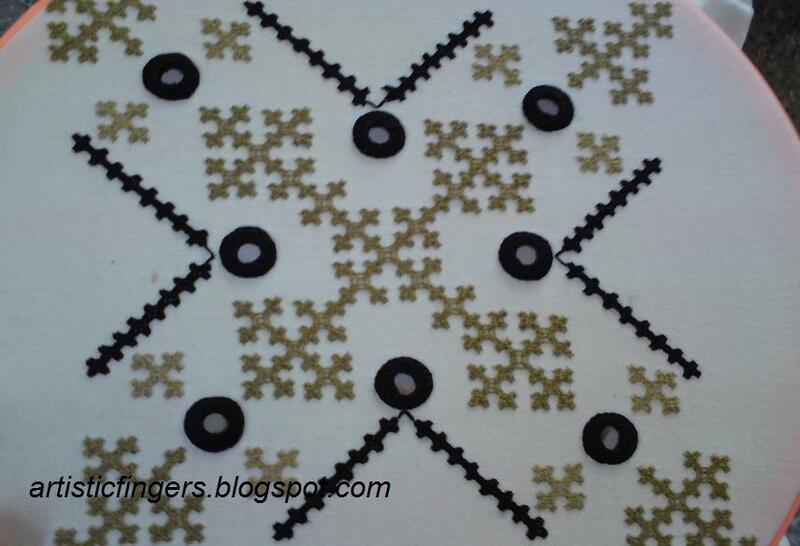 Crochet paisleys.Yet to block these lovely motifs. 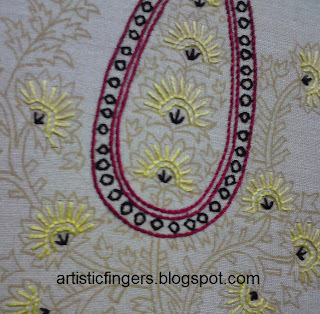 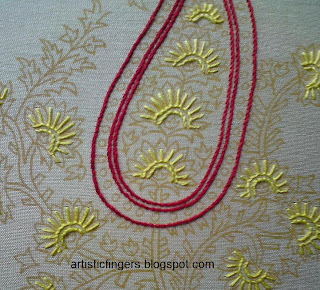 I've received few mails suggesting stitch-alongs.I honestly don't know how many of you will be interested to participate in an INDIAN EMBROIDERY SAL.If there are interested stitchers out there then I'd like to organize one.Let me know if you are interested. 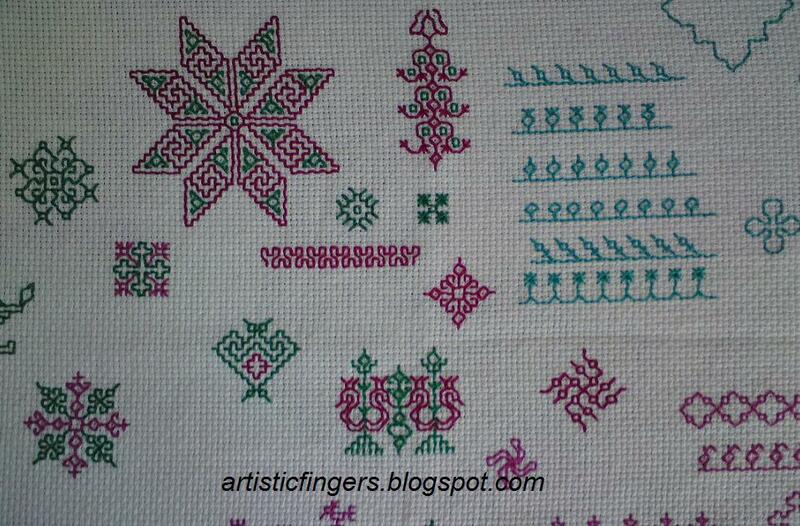 I've finished the embroidery part in a new project - a small bag /pouch last week. 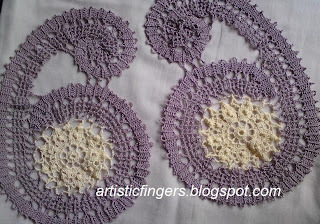 I've used a variegated stranded cotton thread. 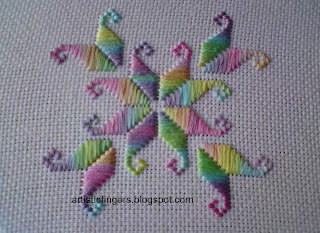 I didn't control the color placement in this project,on purpose. 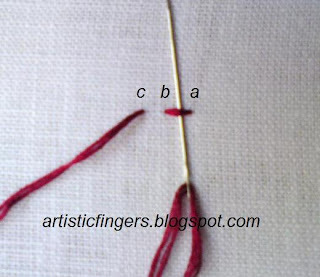 What do you all do - Do you always control the color placement or work the thread just as it comes off the skein ? I'd like to show you all a portrait which I've finished . 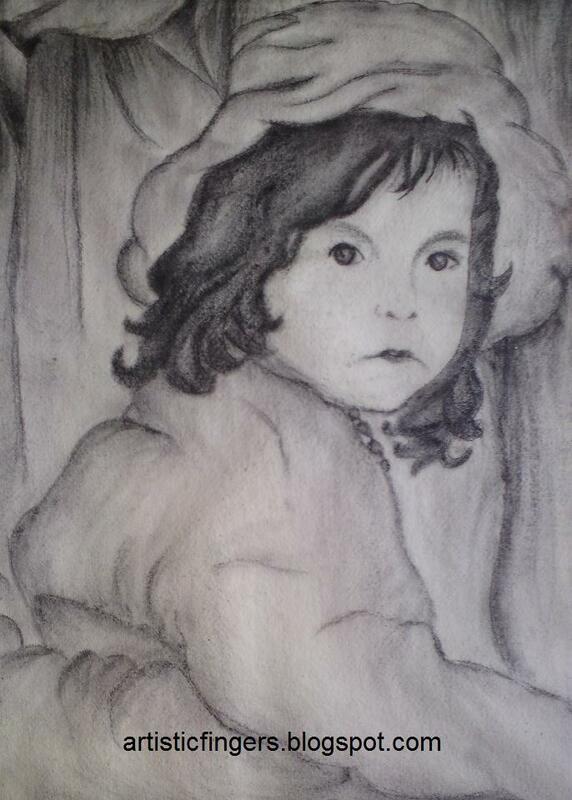 I've used fine charcoal to draw this. I've worked only a little in Kashmiri paisley project since I was busy with a couple of commissions. 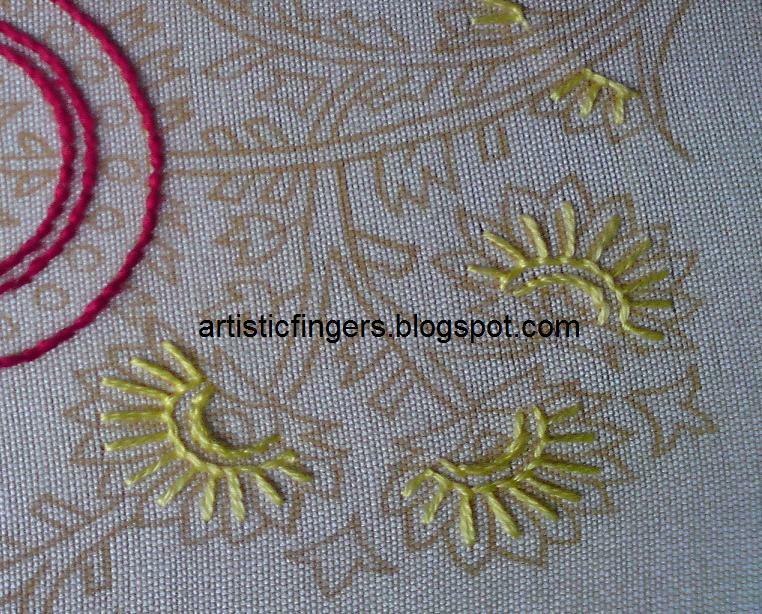 I've used yellow stranded cotton thread for the flower center. 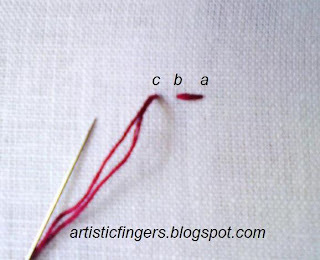 A row of blanket stitch is worked first and the second one is stem stitch.